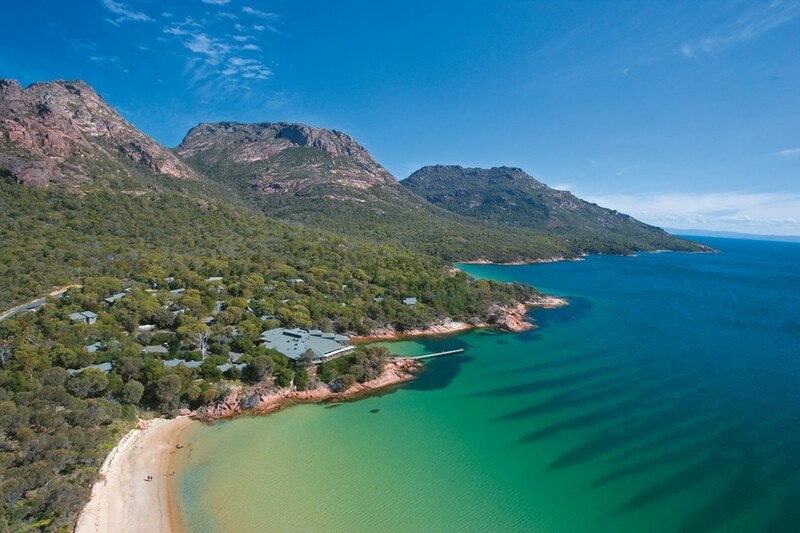 Having acquired the property recently, RACT Destinations was keen to upgrade. Liminal was commissioned to transform the visitor experience through the conceptualisation, design and delivery of nine pavilions tailored to celebrate the scenic qualities of the unique setting. 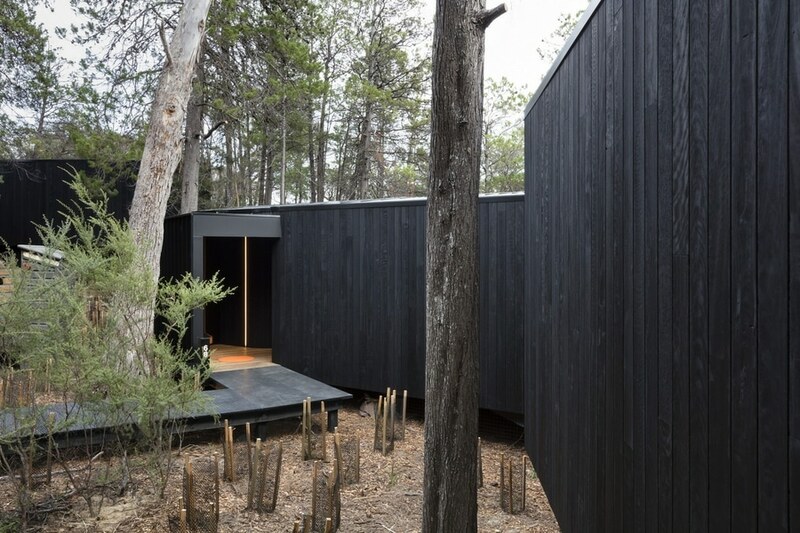 The Pavilions provide a point of difference to the existing 60 cabins, offering a quality, contemporary, ecosensitive, site specific experience. 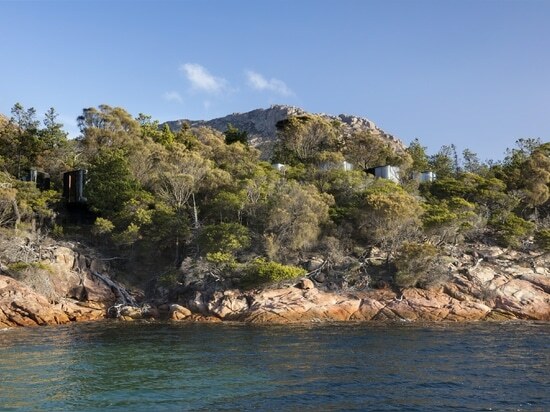 Liminal drew inspiration for the new Coastal Pavilions from the fluid topography of the nearby bays and layered coastal granite rock formations, while paying homage to the character of the National Park they nestle into. 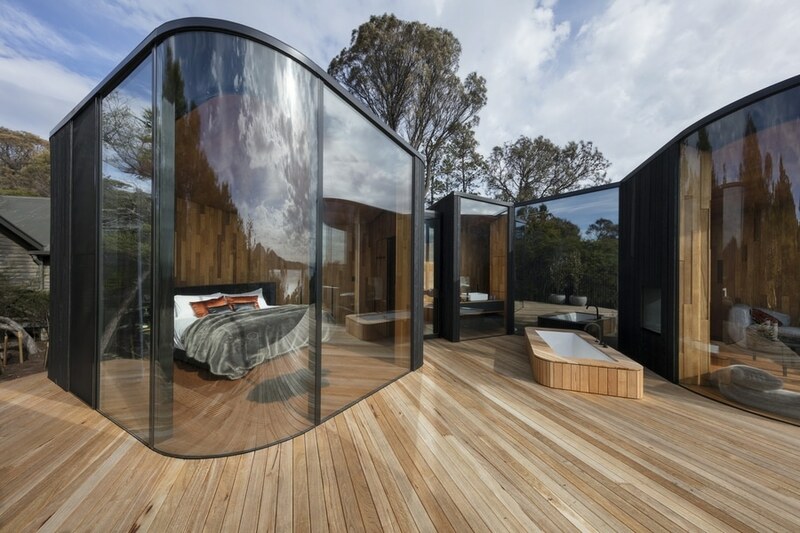 Floor to ceiling curved windows bring the outdoors in, emphasizing the experience of being immersed in nature. The positioning and interplay of the living room and bedroom wing form an embrace reminiscent of nearby bays, protecting the generous deck and offering privacy to the outdoor bath. 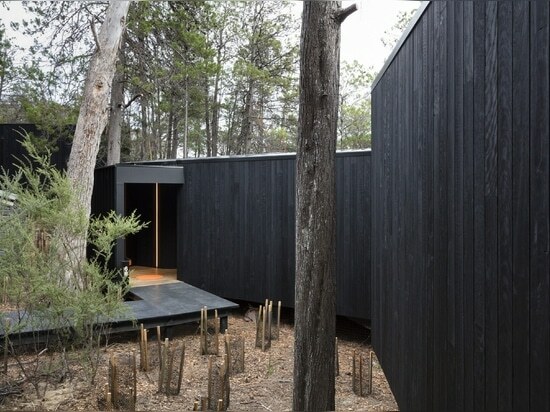 The black, exterior protective shell is made of Red Ironbark that is charred – referencing the significance of fire in the bush environment, while also increasing the longevity of the timber and ensuring the pavilions are visually discreet. Liminal was conscious that any insertion into the natural landscape had to be a backdrop that presented a quiet response to its immediate context. 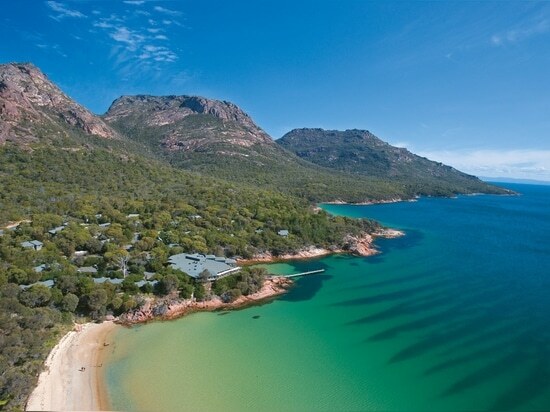 Considerable time was spent on site locating the pavilions to ensure the optimal experience of seclusion and immersion could be achieved. The solid form seen on approach plays an important role in the hide and reveal. 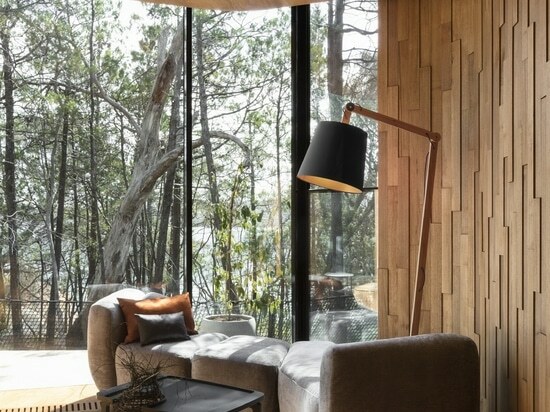 The water views and the intimacy of being nestled in the bush, further enabled through the expansive floor to ceiling windows, isn’t fully realized until the front door is opened. 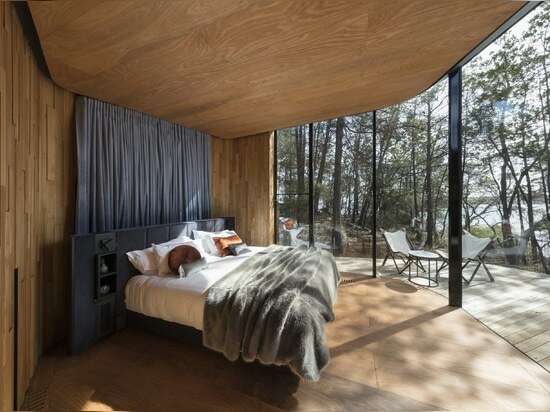 The interiors of the Pavilions are immersed in the warmth of Tasmanian timbers. 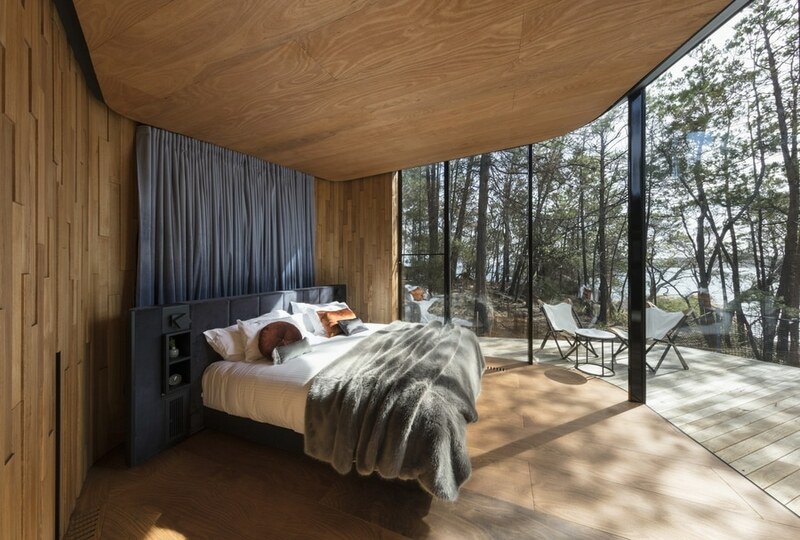 Offcuts of Tasmanian oak timber, Blackwood and the only plywood to be manufactured locally, totally enwrap the interiors to emphasise a completely Tasmanian experience. 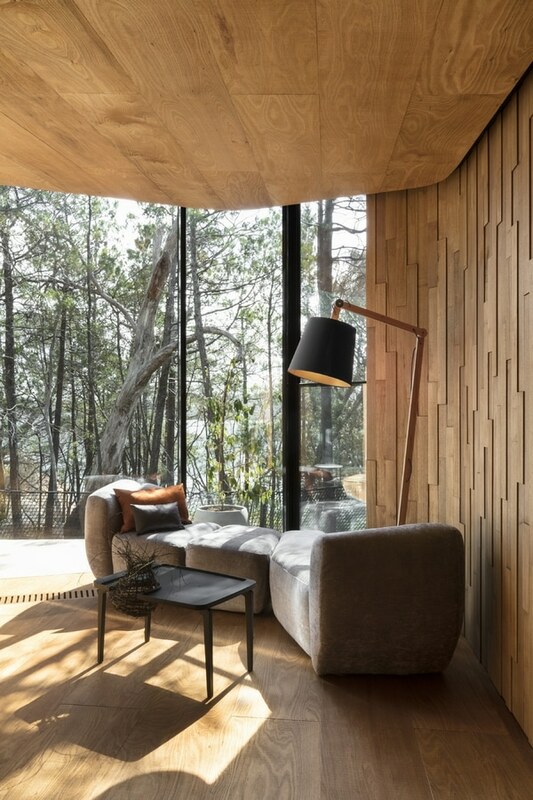 Using and showcasing utilitarian and natural materials in innovative ways have created a unique atmosphere befitting of its setting. An experiential highlight is the netted, hammock-like balustrades. Recognising the desire to retain the views that a standard balustrade would interrupt, Liminal devised the unique solution that provides a novel opportunity for relaxing and enjoying the incredible setting. 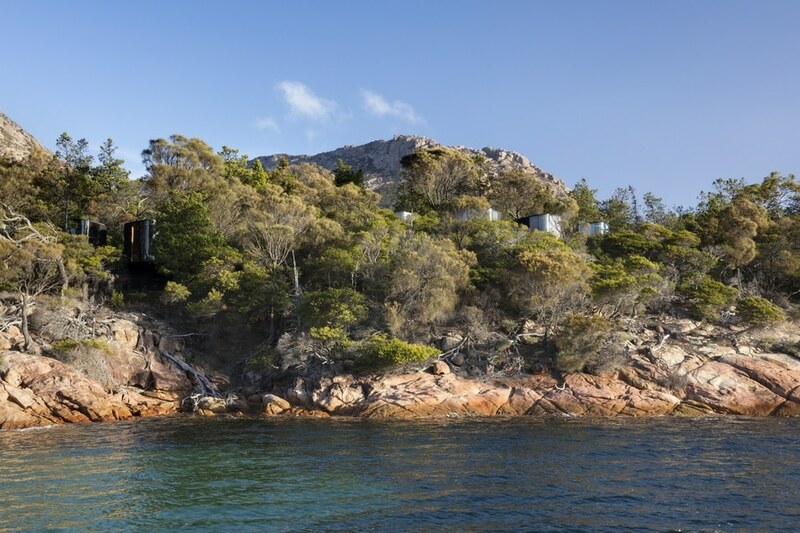 The simple colour palette that guided the choice of fabrics respond to the coastal textures and variety of greys, oranges and blues found in the nearby granite rocks, rich coloured lichen and deep blue ocean. 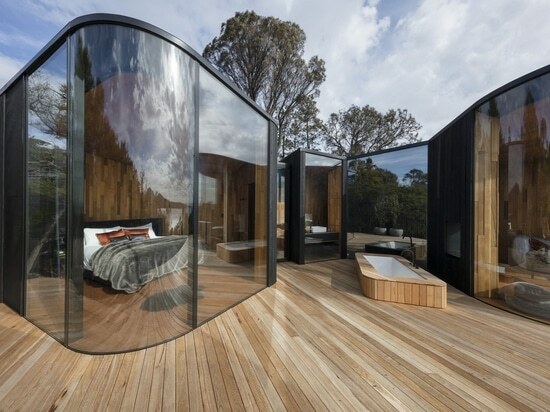 The absence of right angles combined with curved forms, meant that the builders’ skills were put to the test. The skill of the builders to achieve the meticulous detailing required, reminds us of what true craftmanship is.